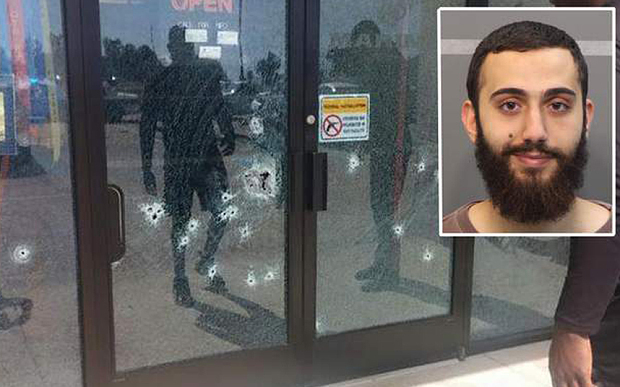 Buried in a CNN report on the Islamist terror attack in Chattanooga, Tennessee on Thursday against military facilities that killed five servicemen and wounded a Chattanooga policeman is a report that the gunman, Mohammad Youssuf Abdulazeez, was actually Palestinian, not a Kuwaiti as has been previously reported. “Abdulazeez was born in Kuwait in September 1990, during the Iraqi invasion of that country, Kuwait’s Interior Ministry said. The ministry didn’t explain how Abdulazeez came to be born there but said he holds Jordanian citizenship. “Jordanian sources, however, denied that he was a Jordanian citizen, but rather a Palestinian who carried a Jordanian travel document. The sources said he was born Mohammad Youssuf Saeed Hajj Ali on September 5, 1990, but that his father changed his name that year to Abdulazeez. “Mohammad Abdulazeez was born in Kuwait in September 1990, during the Iraqi invasion of that country, Kuwait’s Interior Ministry said Friday, but he was also a holder of a “temporary Jordanian passport,” according to a Jordanian government source. “They explained that Abdulazeez was a Palestinian who used the temporary Jordanian passport as a travel document. Jordan issued such temporary passports to Gazans and some other Palestinians. But the officials stressed he is not considered to be a Jordanian citizen. “Abdulazeez was in Jordan in 2014, when he visited an uncle there; it is believed he spent months there on his visit. Reuters reported in an exclusive on Saturday that just hours before the attack on Thursday Abdulazeez texted a message to a friend with a link to a verse in the Koran that spoke of ‘declaring war’. The article was datelined Chattanooga indicating the friend was located in Chattanooga.